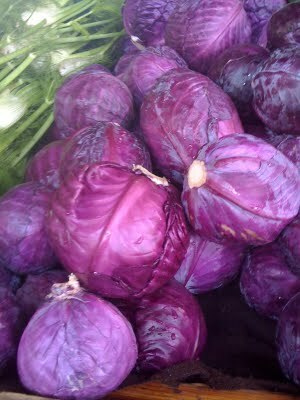 The Ithaca Farmers Market was a riot of color, scent, flavor and image pointing to the absolute bounty this area has at this time of the year. 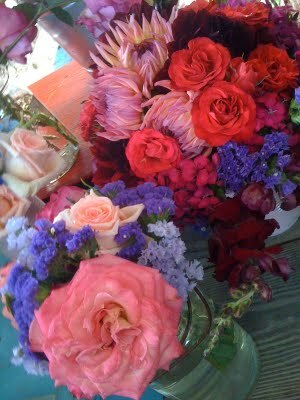 The flower vendors, who will make you a bouquet for $10 of flowers you pick, had buckets colorblocked and bursting with peach gradient dalias, zinnias of every shape,color and size, roses, sunflowers, daisies, delphinum and the list continues. 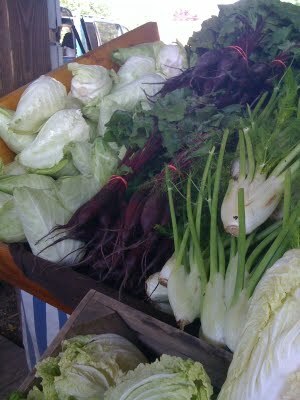 There were piles of produce with long beets abutting piles of red cabbage. 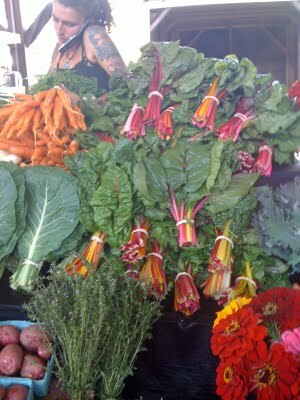 Kale or some leafy vegetable with multiclored stems in yellow, pink red, maroon, and orange. Even the people, many tattooed in a very recognizable way, seemed to add to the painted environment that the market provided. We had a little lunch (a samosa for me, and peanut lime noodles for R), bought a big bag of basil and an equally grand bouquet of parsley. We strolled along the lake edge with Shady Grove who was actively interested in the ducks. We let her off her leash and she bounded carefully into the water and actually started to swiim towards the birds. A first for this water dog! I did a little shopping with Maddie on the commons and discovered this great sample store where I bought some cool teeshirts with thai leaf writing and asian inspired patterns ($5. a pop). Worth visiting again as the selection is interesting, random and very european cool. I did some sketches on the iPhone app. Today, I will render them to get in front of the work required for Tuesday (assigned around 5 on Friday). We plan on seeing "Anvil" at the new and improved Cinemopolis. There is a leak in the roof. Gotta go check things out--rain seems to want to come into the house in many and varied ways. Time to look for a flashlight.